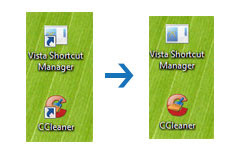 How to remove short cut arrow from Vista? 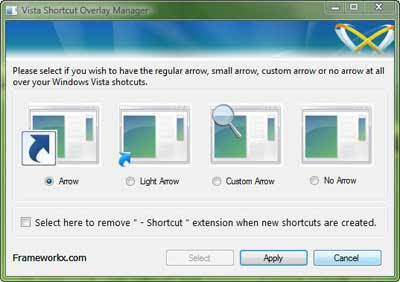 If you like to have a clean look of your short cut icon on your Windows Vista desktop, here is a free tool Windows Vista Shortcut Overlay Remover (FxVisor) that enables you to remove or change arrow on short cut icon. FxVisor, developed by FrameworkX, is a small (1.6Mb) application, which changes necessary registry settings automatically to have no arrow, light arrow or custom arrow on your short cut icon. After selecting your option click apply and restart your system.